Becoming an astronaut is the ultimate fantasy for most children. For Dr. Ryan Stone and astronaut Matt Kowalski, however, it is a nightmare of epic proportions. In their new film, “Gravity”, Sandra Bullock and George Clooney star as two astronauts struggling to survive their space odyssey under impossible circumstances. 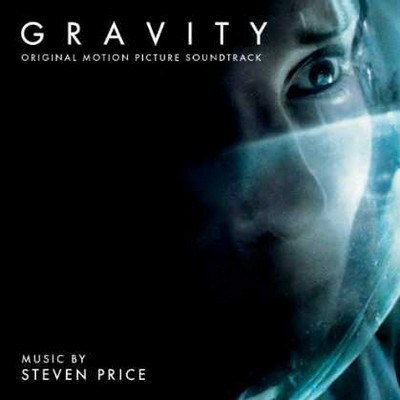 Composed by Steven Price—who recently conducted “The World’s End” (2013) and worked in the music department for the films “Marley” (2012) and “Mr. Bean’s Holiday” (2007)—the score to this sci-fi adventure will have you imagining you are in space, flying among the stars. The galactic journey begins with the mystical and beautiful melody, “Above Earth”, the calm before the storm. Imagine staring at the stunning view of earth, feeling nothing but peace and serenity. That peace is soon replaced by destruction and fear in “Debris” and “The Void”. The rush of adrenaline fills Dr. Stone and Kowalski’s very beings as they struggle to survive the impact, knowing that time is not on their side. “Atlantis”, “Don’t Let Go”, “Airlock” and “ISS” show Dr. Stone’s fear and Kowalski’s reassurance that they will survive their experience. The soft piano and sound effects will have you sympathizing with Dr. Stone as she struggles to make her way to safety, only to find the shelter she seeks is not what she anticipated. That reassurance is short-lived, as proven in “Fire”, “Parachute” and “In the Blind”. The terror and anxiety that you feel will leave your heart heavy. The melancholy vocals and the somber glass harmonica symbolize the solitude and coldness of space and the feelings of despondence. “Aurora Borealis”, “Aningaaq” and “Soyuz” have a heavenly, almost angelic sound. The vocals and music are peaceful and feel like a sweet dream from which you will not wish to wake. However, for Dr. Stone, these beautiful melodies characterize a nightmare from which she wants to escape. “Tiangong”, “Shenzou” and “Gravity” will allow you to share in Dr. Stone’s renewed strength in her resolve to return home. In witnessing her valiant journey, you will share in her resilience and new found faith. Steven Price’s amazing masterpiece gives you an insight to the emotions that Dr. Ryan Stone experiences throughout her journey. Many of these tracks have an inspirational theme to them, and that is definitely a plus. This score perfectly makes the movie.